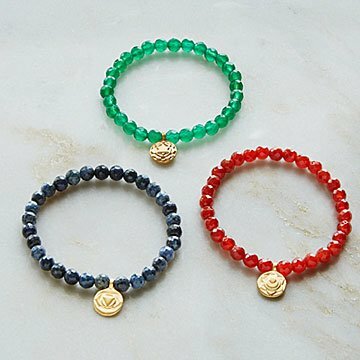 Everyday enlightenment abounds with these stackable chakra bracelets. Find your flow with the help of Satya Scainette's enlightening bracelets. Each features a gold-plated lotus pendant surrounded by colorful stones, and comes with a mantra that corresponds with one of the seven chakras. Choose a focus and repeat the words when you need a boost, or stack several for gentle reminders to stay centered throughout the day. Handmade in New York. STORING JEWELRY When you are not wearing Satya Jewelry, it should be stored in an airtight plastic bag. This will prevent tarnishing and scratching. WHILE WEARING YOUR JEWELRY Exposure to water, lotions, body oils, cosmetics, perfumes, excessive heat and humidity and cleaning agents may cause discoloration and affect the finish of the jewelry. HOW TO CLEAN YOUR JEWELRY After much research, we have found that polishing papers work best to restore luster to our sterling silver pieces. Sterling silver pieces can be cleaned best with our polishing paper.